This is part 2 of our blog series on the history of women artists in New Mexico. NEW LANDSCAPES, NEW VISTAS: Women Artists of New Mexico. “I have alluded to Nampeyo as a ‘modern artist,’ because the more I understood her life and work, the more her extraordinary career seemed to parallel that path,” writes Steve Elmore in the last chapter of his book In Search of Nampeyo. Elmore stepped in as our guest blogger last week, which gave us some time to study the links between Pueblo aesthetic innovations and the diverse New Mexico art movements that emerged in the 19th and 20th centuries. What did romanticist painters of the early Santa Fe and Taos art colonies learn from Pueblo traditions that had been around for centuries before they arrived? How did the elegant abstract patterns on San Ildefonso jars and bowls influence abstract expressionists like Beatrice Mandelman and Janet Lippincott? While much of Nampeyo’s life was that of a traditional Hopi woman, we need to consider her life and work outside of the academic fields of archaeology and anthropology, which have heretofore defined how Nampeyo has been perceived by the public. Today, her masterpieces are mostly displayed in natural history museums next to Anasazi jars or in anthropological exhibits of Pueblo Indians—not in art museums—and certainly not as modern art. Yet, in the end, Nampeyo was not an ancestral potter, nor even a traditional Pueblo potter, although these conditions were the context for her achievements. While she was trained as a traditional potter, she evolved into a unique artist using modern marketing techniques to sell her work to a new Euro-American audience. As Elmore stresses, it’s important to understand Nampeyo, Maria Martinez and other influential Pueblo potters not as isolated traditionalists but as artists who interacted with newcomers and adapted to the cultural changes they affected. The realities of frontier living necessitated a constant dialogue between the first artists who emigrated from the East Coast and Pueblo artisans. This interchange continued as the market for Pueblo arts and crafts grew and shifted based on the demands of visitors. Ila McAfee (1897-1995), one of the early “Euro-American” transplants, drew inspiration from Pueblo traditions in her work. 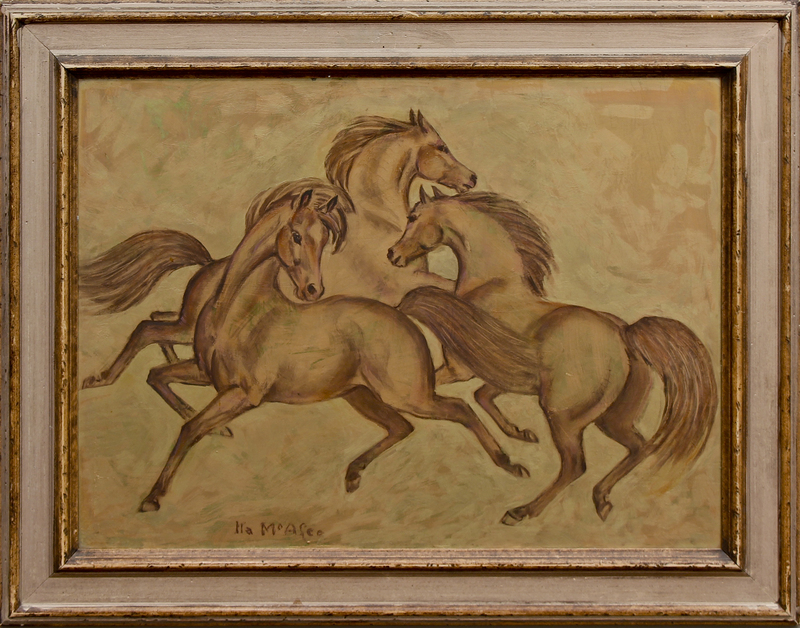 McAfee often painted wild horses in profile, echoing the stark monochrome of pottery designs. In The Golden Triad, three beasts hover before a textured golden-brown field that captures the hues of high desert clay. It was so different then. There was nothing between me and the mountain when we first got here. The village was small and the Indians remained uninfluenced by the invaders. Once I asked one of them, ‘What did you call this country before the Europeans came?’ ‘Ours,’ he told me. Other early Taos artists such as Helen Greene Blumenschein (1909-1989) and Dorothy Brett (1883-1977) also interacted with the nearby Pueblo. Blumenschein meditated on the relationship between the new settlers and the natives in her Taos memoirs, and Brett spent years making genre paintings of the Taos Poblanos. Later on, Brett switched to more mystical subject matter that was inspired by Native American spirituality. 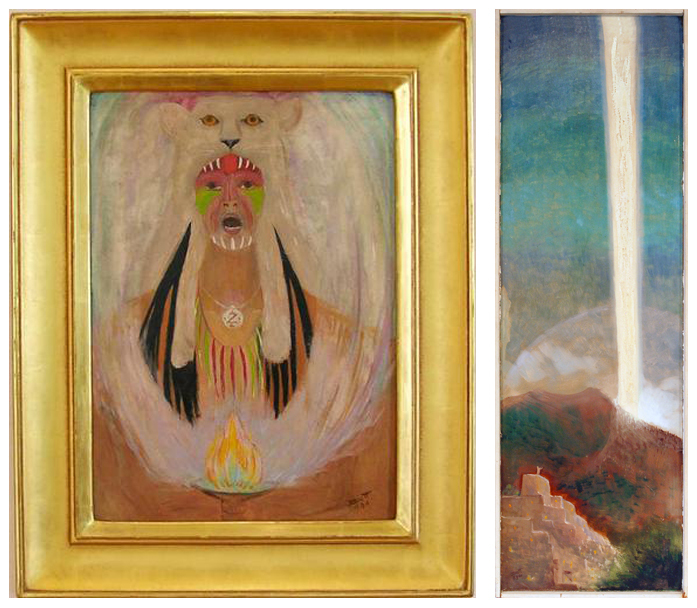 Her paintings Cat Shaman and Moon Ray reflect her mature philosophies that link humanity and nature. In the 1930s, Santa Fe artist and archaeologist Agnes Sims (1910-1990) arrived in New Mexico and began studying the ancient Pueblo petroglyphs. As she pondered the mysteries of the lost language, she began developing her own abstract symbol system in a series of paintings and sculptures. Nampeyo’s abstract drawings are strangely prescient of the abstractions of Euro-American modern art. This remains a large part of her mystique. In particular, critics have noted the comparison between Nampeyo’s abstractions of birds to Pablo Picasso and Georges Braque’s invention of Cubism, wherein an object is shown from multiple views at the same time. 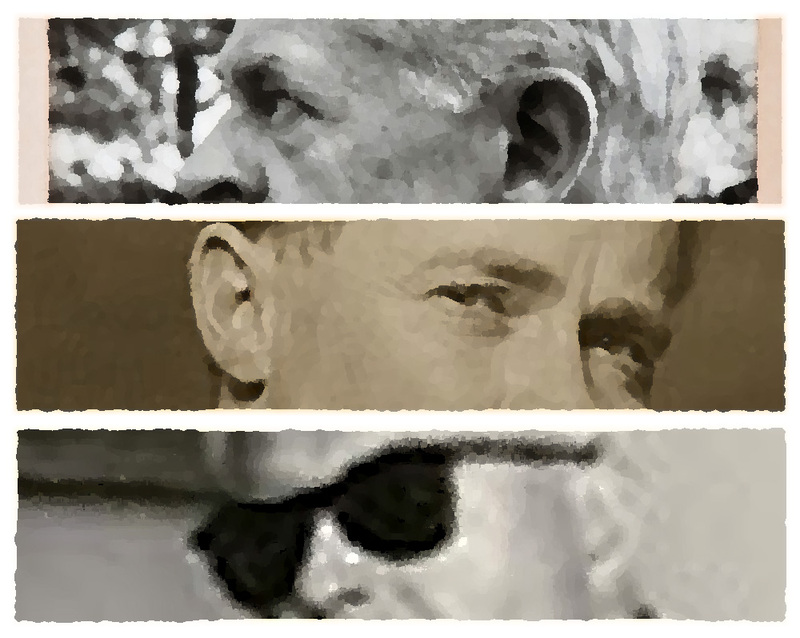 Elmore’s observations complete the circle of influences, revealing a far more interconnected aesthetic evolution than we originally imagined. Check back next week for the continued tale of women artists in New Mexico, and connect with us on Facebook, Twitter and Pinterest for daily gallery news. *Images of Nampeyo’s pottery courtesy of Steve Elmore. Image of New Mexico petroglyph courtesy of Roch Hart. We’re ending our SPRING OF MODERNISM blog series with the tale of a pioneering artist who was the model of a New Mexico modernist. Randall Davey (1887-1964) was born in East Orange, New Jersey. His father was an architect, and he enrolled at Cornell for architecture in 1905. Three years later he dropped out and moved to New York to study art, to the consternation of his father. At the New York School of Art, Davey forged a close friendship with teacher and Ashcan School artist Robert Henri. Henri was friends with the founders of the Taos Society of Artists, and worked hard to cultivate New Mexico’s budding reputation as an arts destination. In 1910, Davey exhibited with George Bellows and Stuart Davis and in 1913 his artwork was in the New York Armory Show, the most influential modern art exhibition in U.S. history. Davey and artist John Sloan visited Santa Fe in the summer of 1919, and Davey fell in love with the Land of Enchantment. His art career in New York had stalled, and the Southwest adventure offered a fresh start. Davey bought an old mill on Upper Canyon Road and moved there permanently the next year. It was a path that had been calling him since his early days as an artist. Inspired by the metropolitan subject matter of the Impressionists, Davey developed a diverse oeuvre of still lifes, horse-racing and polo scenes, artistic nudes and landscapes. Davey was a true Renaissance gentleman: he made paintings, prints and sculptures, played cello, built a polo field on Upper Canyon Road and was always dressed to the nines (even when he was painting in the hot sun). The lifelong automobile enthusiast died in a car accident on a trip to California at 77 years old. After his death, his wife donated the Davey house and land to the Audubon Society. The Randall Davey House is still open for tours on Fridays, and stands as a tribute to an artist who helped make the Santa Fe art colony what it is today. A Davey House docent visited the gallery for our SPRING OF MODERNISM opening, and kindly offered us a private tour. Keep your eye on the blog for photos from the tour and more information on Davey. Make sure to visit our exhibition before it closes on March 31st, and connect with us on Facebook, Twitter and Instagram for more gallery news. contrasts with his soft pastel snow scene that will appear in SPRING OF MODERNISM. The 102nd annual Armory Show opens in New York City this weekend. Its history stretches back to 1913, when the exhibition introduced the European modernist movement to the United States. Featured artists included Pablo Picasso, Henri Matisse, Georges Braque, Vincent van Gogh Gogh and other Europeans. The show also included American artists such as Randall Davey, John Sloan, Paul Burlin, Andrew Dasburg, Edward Hopper, Marsden Hartley and more who had been influenced by the artistic revolution taking place across the Atlantic. Not-so-coincidentally, we’re launching a modernism show of our own this Friday, and it features several New Mexico artists who participated in the original Armory show. During the first half of the 20th century, Davey, Sloan, Dasburg and a great variety of their East Coast contemporaries ventured to New Mexico and reshaped the Taos and Santa Fe art colonies into Western outposts for bold aesthetic innovation. The Taos Moderns, the Transcendental Painting Group (TPG) and other collectives engaged with new developments in the movement, gaining an influential presence on the international art stage. Our SPRING OF MODERNISM exhibition will follow every twist and turn of New Mexico’s modernist movement through significant artworks by Davey, Dasburg, Max Weber, Doris Cross, Russell Cowles, Howard Schleeter, Rolph Scarlett, Paul Burlin, Cady Wells, Jan Matulka, Dorothy Brett and others. It features TPG mavericks Raymond Jonson, Emil Bisttram and William Lumpkins, Taos Moderns such as Beatrice Mandelman, and pivotal Santa Fe modernists including Alfred Morang and Janet Lippincott. The scope of the show is as ambitious as its title suggests— we’re highlighting 50 transformative years of New Mexico modernist history. SPRING OF MODERNISM shows how New Mexico’s art community became one of the largest and most influential in the nation. Look below for some of our favorite works from the exhibition, and check out a special preview on our website. Also, make sure to attend the opening on Friday, March 6 from 5-7 pm! Emil Bisttram, Orbs and Arrows, encaustic on paper, 1941. Jan Matulka, Landscape, watercolor, c. 1923. Doris Cross, Untitled, Mixed Media on Paper. Alfred Morang, Untitled (Landscape), Oil on Board. Howard Schleeter, Untitled (Pueblo), gouache and wax on paper, 1949. Randall Davey, Leaving the Paddock, Lithograph. Beulah Stevenson, Place of the Drums, New Mexico, 1940-45. Paul Burlin, Look—No Fish, oil on canvas, c. 1949. Thomas Benrimo, Nymph of the Sea, oil on board, 1949. Andrew Dasburg, April Snow, pastel on paper, 1967. Make sure to follow us on Facebook, Twitter and Instagram for more gallery news, and stayed tuned for information on our modernism-themed dinner at Coyote Cafe! That’s the most frequent question we’ve received from Alfred Morang fans who’ve come to our show in the past few weeks. It’s common to see one or two works by the Santa Fe master in a gallery’s collection, but it’s quite a special experience to view 37 pieces in one place. Truth is, we called our exhibition MORANG AND FRIENDS because we thought Morang’s contemporaries would dominate the show. It was only through a huge response from the Santa Fe community—private collectors, dealers, galleries—that it all came together. We’re so grateful to everyone involved for working with us, with special thanks to El Farol, Silver Sun Gallery, the Matt Kuhn Collection and our co-curator Paul Parker. And what a show it was! As we take the paintings down today, we’re feeling quasi-nostalgic for the Santa Fe golden age that Morang’s diverse body of work evokes. For the last 21 days, we’ve been transported to a City Different full of wild saloons and drunken shootouts, free-flowing absinthe and spooky ghosts. This portrait of Alfred Morang appeared in the exhibition courtesy of the Matt Kuhn Collection. It was made by another colorful Santa Fe character, Thomas S. Macaione (1907-1992), also known as ‘El Diferente’. Macaione’s mature painting style was heavily influenced by Morang’s teachings, and they also had similar lifestyles. They lived as true bohemians, devoted to art above all else. [Morang] died as he lived: alone. Yet he was never lonely, for he was a creator, and creators learn early in life to bridge the gap between the pain of loneliness and the peace of solitude. With no material wealth, he was one of the richest human beings who ever lived. Everyone who knew him, and some who didn’t, feel a sense of loss at his passing. It is deeply significant that in this time of readjustment in almost every stratum of life, a few people are intent upon an important branch of cultural development. In Santa Fe the founding of the ‘American Foundation for Transcendental Painting, Inc.’ marks the start of a new phase of American art. […] Briefly, transcendental painting is no school or ism. It is a phase of art that, out of many more or less isolated experiments, has evolved toward non-objective painting, the type of painting that is not dependent upon an object, in nature, but is deeply concerned with forms conceived by the imagination. The TPG only lasted a few years, disbanding in 1942 because of World War II. However, the collective’s influence endures in the Southwest and beyond. Some consider the group an heir to Russian Constructivism and the Bauhaus. Morang completed a number of abstract works inspired by the group’s philosophy, including the oil painting above titled “Into Tomorrow“. Click here to see more. This portrait of Alfred Morang isn’t the only artwork by Lippincott that appeared in the show. Click here to see more. Dorothy Morang (1906-1994) was born in Richmond, Maine. She met Alfred in 1925, and they were married in 1930. They lived in Portland, Maine for a number of years, and moved to Santa Fe in 1937 to alleviate the symptoms of Alfred’s tuberculosis. DOROTHY MORANG: Yes, I started even more seriously. I’d been working quite steadily in Portland, Maine – Alfred and I lived there for about seven years before we came here – and I went on and worked very seriously with some criticism from Alfred and from Raymond Jonson, who was living in Santa Fe then. […] Alfred had also taken up writing, and he was very active, as you know, on radio, too, interviewing artists on the radio. He had an interview program for several years. He was extremely active. “[Alfred Morang] taught half of us how to paint and the other half how to see,” remarked an unknown Santa Fe artists after Morang’s tragic death in 1958. The Morang School of Fine Art was instrumental in the development of a new generation of Santa Fe artists. At the time of Morang’s death, William Vincent Kirkpatrick (1939-2004), one of his star pupils, was studying at the Taos School of Art. He returned to Santa Fe, rebuilt his master’s studio and worked on a series of canvases inspired by Morang’s vivid hues and painterly textures. Vincent Kirkpatrick also did a painting on the wall at El Farol near Morang’s series of murals, ensuring that their work would hang side-by-side for years to come! 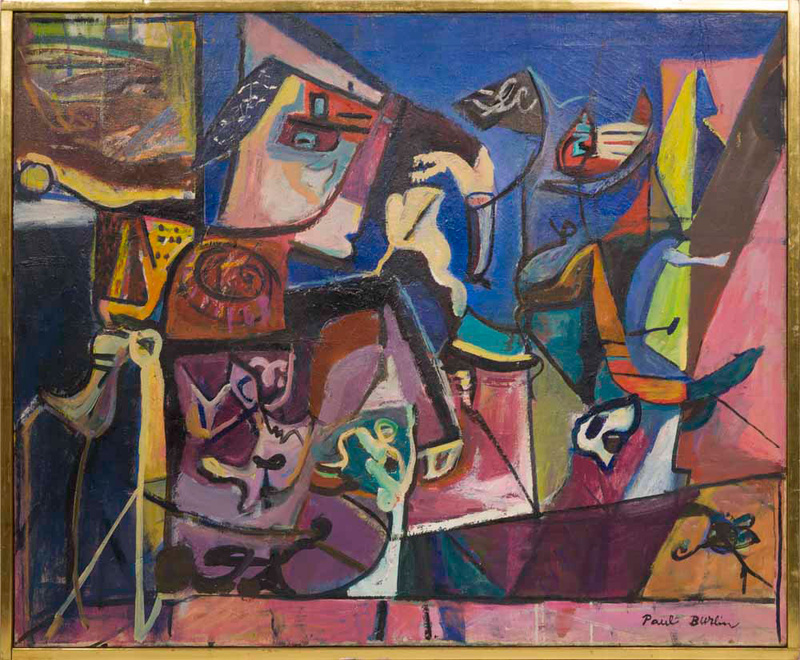 Learn more about Alfred Morang and his contemporaries on the Matthews Gallery website, and make sure to connect with us on Facebook, Twitter and Instagram for daily gallery news. Also keep your eye out for our 2015 exhibition schedule, which will explore other corners of the Santa Fe art colony. Coming very soon! Special announcement: We’ve officially extended our MORANG AND FRIENDS exhibition through Friday, January 2nd. Come trace the legacy of ‘Santa Fe’s Toulouse-Lautrec’! Cheryl Ingram strolls into Matthews Gallery and beams up at a sign that hangs high on the wall. “There it is, Claude’s Bar,” she says. Ingram is the co-owner of Silver Sun Gallery, which is just down the street from us. Her gallery once housed Claude’s Bar, and this Santa Fe relic is usually on display there. Ingram kindly lent it to us for our MORANG AND FRIENDS exhibition. Though Claude’s was established just two years before Alfred Morang’s death, he quickly took a liking to the tavern and its charismatic owner, Claude James. In fact, Claude’s was his last stop before the fire that ended his life in January, 1958. About two decades after Morang’s death, Ingram and her business partner Deanna Olson arrived in Santa Fe. They were retired school teachers who had been traveling around the country selling handmade Native American jewelry. When they reached the City Different, they stuck around and founded Silver Sun. In the years since 1980 when they opened the business, they’ve become the keepers of countless stories about the infamous saloon that preceded them. As Ingram strolls around the gallery smiling at the colorful canvases, she can’t help but pass on some fascinating tales of Canyon Road. Ingram analyzes a painting of ladies dancing on a stage, concluding that it’s probably a view of El Farol. She and Lawrence linger by a watercolor of a bustling restaurant and try to identify where it might have been. She finally stops before a large painting titled ‘The Women at Claude’s’, and the stories really start rolling. “Claude’s mother was French, and she married an editor at the New York Times whose last name was James,” Ingram says. In the 1950’s, Claude and her mother embarked on a road trip to California along Route 66. On their way back they took a detour to Santa Fe and never left. Claude followed in her father’s footsteps and took a job as a journalist for the Santa Fe New Mexican. One year her house caught fire, killing her two corgis. A reporter snapped a photo of the dead dogs and published it in the paper the next day. Claude was so disturbed that she swore off journalism. She and her mother bought a building on Canyon Road’s 600 block and opened a bar and restaurant. Claude often tended bar barefoot with a pack of cigarettes folded into the sleeve of her shirt, Ingram says. She would throw patrons out of the bar “by the belt and shoulder” if they got too rowdy. “Canyon Road wasn’t paved then, so the landing was a little softer, but you didn’t mess with Claude,” Ingram says with a laugh. She was a handsome woman, but not a pretty woman. She was short but you didn’t mess with her. A guy came into Silver Sun about 1982, looking for Claude’s Bar. I told him he was a little late, and he told me a story about Claude. He said he had ordered a beer and Claude was working the bar. He noticed this pretty woman sitting at the other end of the bar. He tried to hit on her, and next thing he knew, his tie, shirt and coat were pulled across the bar. “You leave my woman alone,” Claude said. He was so upset, he didn’t finish the beer and left. Each corner of the bar had its own persuasion. You had the gay men over here, the gay women over here, and the three piece suits were over there with the ladies of the night. Claude was like a teacher in the classroom: one corner did not mess with any of the other corners, or your fanny was out of there. There was an ambiance that was going on in there that was truly Santa Fe of the period, and that’s why she was so popular. You were okay if you got in there. Even if you got stumbling drunk, someone would be there to protect you from some nasty politician or a cowboy with a gun. There were honest-to-god cowboys who wore guns. A fight broke out between them and the gay guys once, and everyone had guns. There were two lines of guns, about ten or twelve feet apart, and they were drunk and shouting. That story came from a lady who was hiding under the bar. She was the barkeep on Saturday night. It looked like they were shooting around each other, trying to scare each other. One guy did take a hit in the fanny, however. When the cops got there, they just took the whole batch. The next day, the barkeep quit. Towards about 1970 or 1971, there was a dance floor way in the back where a sculpture garden is now. A guy named Jimmy was up there playing—his wife told me this story—and looked past all the drunks to the door. Here was this lanky guy with a guitar case who saunters over to Jimmy. “Mind if I play along?” he says. Jimmy just had a cow. They played all the rest of the night together, and no one besides Jimmy recognized him. It was Jimi Hendrix. They were all too drunk. Claude eventually lost interest in bar tending and hired someone else to manage the establishment. The saloon closed in the late 1970’s but its charismatic owner remains a legend among Santa Feans. It’s fascinating to hear Ingram’s tales, especially because they’re rare firsthand accounts. They’re all from people who have passed through Silver Sun over the years to pay tribute to Claude’s. Since MORANG AND FRIENDS opened two weeks ago, we’ve had visits from many people with Santa Fe stories like these. We’d like to thank everyone who shared with us. Your words have helped inspire our upcoming exhibition schedule, which will delve into many corners of the Santa Fe art colony. Stay tuned! For more gallery news, make sure to connect with us on Facebook, Twitter and Instagram.